University Crossings has the largest bedrooms on campus! 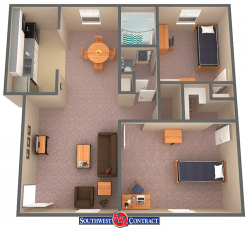 This residential community is perfect for upperclassmen and graduate students who are looking for a place on campus that is a little quieter. It features private entrances and convenient parking and is located near the Fine Arts Building and the College of Health Profession. Georgia Southern University offers students the advantage of living in a unique, apartment-style environment while staying in on-campus housing. Enjoy the great benefits of your large personal space providing you with serenity in your home away from home! 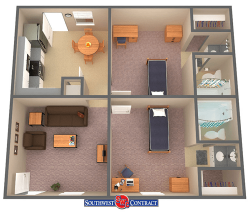 University Commons floorplans offer private unit apartments! All bedrooms are equipped with an extra-long twin bed, desk, and chair. Private and shared full bathroom options are available in this residence hall. Rates listed below are for the 2019-2020 Academic Year. *Rates are per person/per semester. An additional $20 Activity Fee is charged every semester. All rates are pending until approved by the Board of Regents of the University System of Georgia. Students are required to respond to email or paper correspondence from the Georgia Southern University Office of Student Accounts, Financial Aid Office and/or Registrar’s Office regarding outstanding requirements for processing financial aid packages for payment on their account. **All dimensions are approximate size, there are some variations in dimensions for some rooms. Call (912) 344-2940 for questions about living on campus at University Crossings.